It’s a great simple lighting controller that’s easy to understand. and then control via MIDI hardware. and even output it again for simple backup control and testing. Save your DMX values into an almost unlimited number of scenes, all HTP merged with their submasters. You can save all these into regular document files to backup, transfer between computers, or archive for when you’ll next need it. Control scene intensity submasters with MIDI Control Change or Note messages. Works great with simple hardware MIDI controllers or even show control systems. DMX Assistant’s light up faders make it really easy to see your DMX levels at a glance. They glow brighter at 100% so you don’t have to double check. All 512 channels are useable. The grid view makes it easier to see a large number of DMX channels all at once where the specific values are important. Great for working with intelligent fixtures. 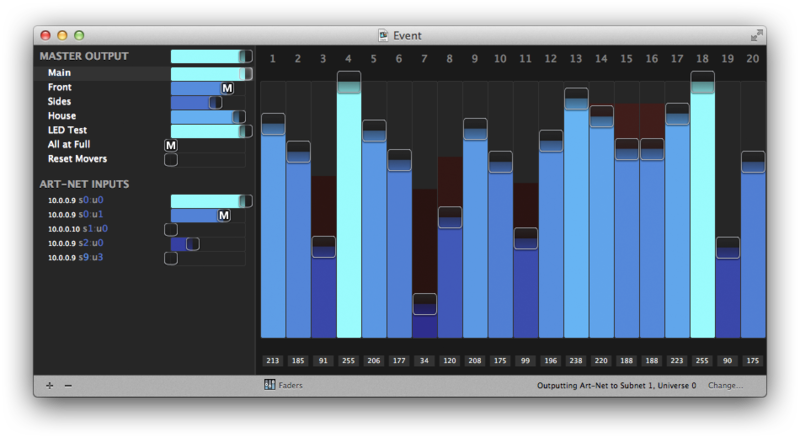 The histogram gives a rough over-view of your entire DMX universe. You can see how much is being used, and any patterns or glitches. DMX Assistant can visualise arrays of RGB LEDs. However, it may not work for all setups – it simply uses the entire universe in groups of 3 RGB channels. You can see all the Art-Net being broadcast around your network in the scene list. The IP address, subnet and universe of each is shown to make it easy to trace what’s going on in your network. You can easily output DMX via broadcast Art-Net, to a selectable subnet and universe. Multiple universes can be sent by opening multiple document windows. Scenes are merged by taking the highest value for each channel. You can also merge Art-Net inputs into a new output universe. DMX Assistant is designed with a dark interface that’s easy on your eyes in a dark venue. The light-up faders are always clear and easy to see.